The Ultra-portable Compact Size XBOOM Ceramic Mini Portable Capsule Speaker is petite in size but massive in sound. All New Ceramic Drivers able to deliver amazing clarity, warm bass and impressive sound levels. The Enhanced Bass+ Expansion System (BES) is committed to deliver a full-bodied, 360-degree superb sound experience like no other. The built-in battery is rechargeable via USB and offers an impressive 12+ hours of continuous playback time from one single charge. The integrated stowaway 3.5mm stereo audio jack plug and socket connects multiple XBOOM Ceramic Mini Portable Capsule speakers together to take your music experience to the next level. Pick an XBOOM Ceramic Mini Portable Capsule Speaker that matches your style in Classic Black, Blue, Red, Silver, and White. 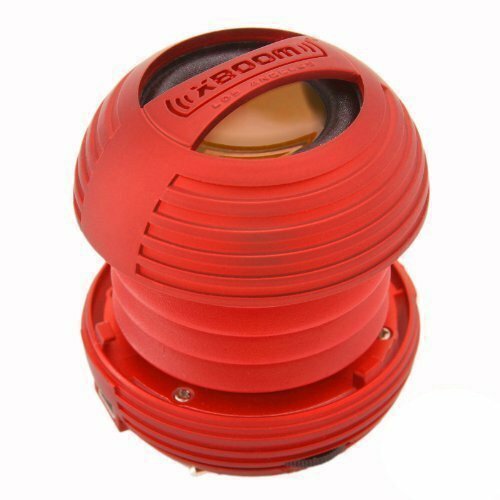 The XBOOM Ceramic Mini Portable Capsule Speaker is backed by manufacturer 1 year warranty. All new, specially designed, in-house manufactured, ceramic drivers able to deliver amazing clarity, warm bass and impressive sound levels. Enhanced Bass+ Expansion System (BES) enables Full-bodied, 360-degree superb sound - 40mm Driver 3-Watt Output. Ultra-portable compact size with long-lasting embedded rechargeable battery provides 12+ hours of continuous playback from one single charge. Free splash-proof carrying travel pouch for easy storage and enhanced portability. Modular "Buddy-Plug" Design: Integrated stow away 3.5mm stereo audio jack plug and socket connects multiple XBOOM Mini Portable Capsule speakers together for maximum sound. Universal Compatibility: All iPods, iPhones, iPads, Samsung Galaxy phones, Android phones, Blackberry phones, MP3 players, CD players, Tablets, PC and laptops, and More. Rated Best MP3 Mini Portable Capsule Aux Speaker of the Year. If you have any questions about this product by XBOOM, contact us by completing and submitting the form below. If you are looking for a specif part number, please include it with your message.